Did you know that in China the number 888 indicates triple fortune? 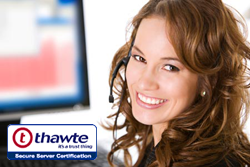 It is believed that the number 888 is a strengthening of the number 8, and addresses or phone numbers which contain the 888 numerical sequence are considered as being particularly lucky – to the point they are worth a higher price. On the other hand, Chinese dragons are often found in Chinese mythology and folklore and may take the form of different animals such as fish or turtles, but more often to four legged snakes. Chinese dragons are a symbol of power, strength and also good luck to people who deserve it – and it was used by the Emperors of China as a symbol of imperial might. 888 Dragons from Pragmatic Play is a three-reel online slot that combines together these two traditional Chinese folklore elements: the number 888 and the dragons. The result is a no-complications spin-and-win online slot which can land you really big rewards! 888 Dragons comes with one very lucky payline which passes across the centre of the three reels. With a Return to Player Ratio of 96.84%, this video slot is bound to bring you quite a few wins rolling in, especially if you are lucky to the power of 888 as soon as you start spinning. 888 Dragons allows you bet from as little as € 0.01 to a maximum of only € 5. All you have to do is select how many coins to play on each line – between 1 and 10 – and the value of these coins which can vary anywhere between € 0.1 and € 0.5. Pragmatic Play have chosen to keep this video slot as a rather uncomplicated game and there are no Free Spins or other bonuses in this game. However, if you’re looking for Free Spins you can head over to another of Pragmatic Play’s Chinese themed online slots, such as 8 Dragons, which offers a Free Spins feature where you get to choose between Free Spins (up to 20) and multipliers (maximum 15x) or balance out between them. 8 Dragons also offers the Mystery Stacked Symbol feature which is also available in the Free Spins mode. There just three symbols in this online slot, paying from left to right only when three of them land next to each on the reels. The three symbols, you might have guessed, are dragons in the shape of an “8” digit. Based on the maximum bet amount of € 5, if you land any combination of differently coloured dragons on the winning payline you will receive a payout of € 50; three blue dragons are worth € 250 while the green dragon will earn you a win of no less than € 500. The biggest prize stands at € 1,000, which will be yours if you land three red dragons side by side. The paytable on 888 Dragons is dynamic, meaning that the wins displayed on the paytable will be updated according to the bet amount you have selected. 888 Dragons comes with a very simple design, with the reels framed in typical Chinese fire colours. The paytable is displayed on the left hand side of the screen so you don’t have to enter the information menu to find it; all the information is also displayed at the bottom of the page, including coin value, bet amount, the remaining balance and the win amount. 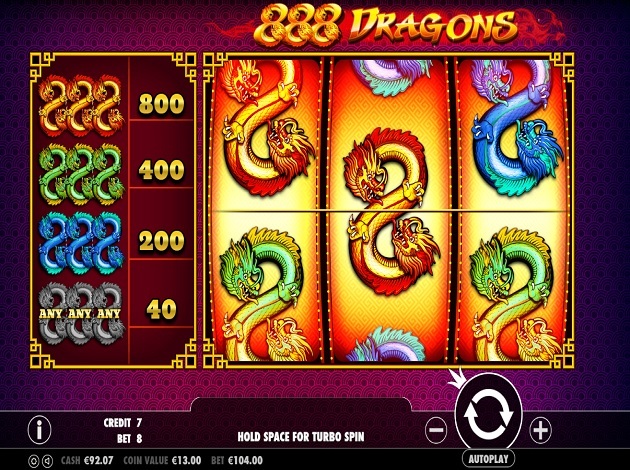 888 Dragons is an uncomplicated online slot from Pragmatic Play, which thanks to the low minimum and maximum bet amounts will be a perfect game for those who are less experienced and would like an online slot that can give them decent size wins at relatively low cost. Get spinning away on 888 Dragons, and may your luck be tripled! Pragmatic Play is one of the greatest and fastest growing providers of both online and mobile games on all devices you can think of. Their repertoire of games is the biggest proof of this, and they are certainly one of the rising stars to watch out for. Pragmatic strive to keep players entertained, satisfied, and constantly looking for more. They have a way of reeling players in by creating and developing products that can suit all kinds of players and tastes, and at the same time being most rewarding. This is the way they have risen amongst others. Pragmatic players are constantly looking for thrills, action and high stakes. Pragmatic knows this and customises its creations accordingly to create the most fulfilling product as possible for the players. Everything produced by Pragmatic is developed and made in-house, including content for over 150 games for both mobile and desktop. Pragmatic wants its games to be the mantra of innovation and dedication to help shape the online gaming industry, as it has shown through games such as Lucky Dragons, Beowulf, Dwarven Gold, 3 Genie Wishes, and Romeo & Juliet.